Man, I know you won’t believe this, but some day you will pay for all for this:). I am neither a fanatic supporter of religions, nor I am here to judge you or make threats, it’s just you have to have limits from time to time:). I am very entertained when reading these comics and you make some damn good points from time to time, but other times you just cross the line:). Keep up the good work, nobody is perfect anyway. lmao . . . the more extreme the more i like it. even deepak chopra says all religions are idiotic. THAT was fantastic! sums up one of judeo-christo-islam’s main motifs perfectly. Love hurts! Love hurts! Love hurts! (No, it doesn’t, only my catholic mother thinks so, which is why I changed my number and didn’t give it to her). Beware of monotheists who profess their god’s love for you. This humor is not extreme. It merely holds up a mirror. That’s its genius. There should be no limits. Who sets them? BTW – is this sung to the tune of Twisted Sister’s “Yer gonna burn in hell!”? If not that, then what? Or is it their own ditty? Funny Funny Funny, all of them. How many fatwas do you have now? I hear you get a set of shot glasses when you get over 10. Seriously though, really funny. Keep at it. 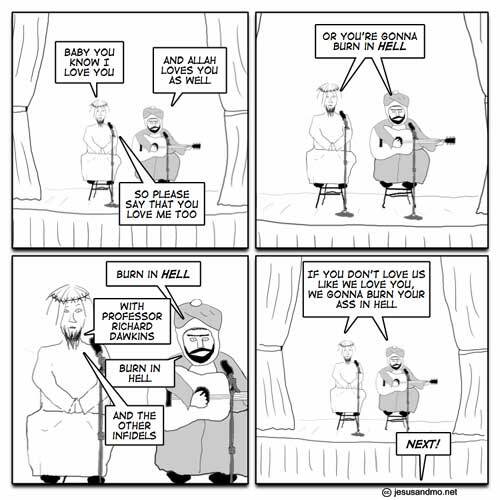 Either love me or burn: Abrahamic religion’s main tactic. Ah, nothing like conditional love. TB: Though in fairness, we would probably have something equally retarded. It would seem that people prefer wishfull thinking to reality, self-delusion to honesty and gullibility to self-reliance. Probably. Even though these three are misogynist enough, and that causes a problem today. This one would make a great t-shirt. I’ve started asking Christians to please stick with “God is omnibenevolent” instead of “God loves you”. No one else is omnibenevolent, so they can define that word any way they want, including the definition they have: focused attention, plus granting eternal pleasure for some, plus feeling either willing or compelled to cause infinite pain for the 80% to 99% who don’t pass. Just leave the good old English word “love” alone. Using it to describe the Christian God’s attitude to humans is a confusing and deeply offensive miscommunication. I suppose the very definition of a terrorist might by: A person who brings intentional serious harm, even death, to innocent people in order to force a government to submit to the person’s demands. Hell is exothermic, need more be said? I love this one! 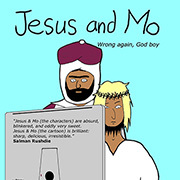 Jesus and Mohammed being friends is so cool!! That SO reminds me of ‘the humans are dead’ by Flight of the Conchords. Thanks, Brad! That is brilliant. Debbie, if you’re going to claim something that goes against common wisdom, it’s probably best to justify it beyond just saying ‘obviously’. Evangalising Christians are forever telling you that the choice is to love God or go to Hell. Maybe if they had rapped it with turntables or beat-boxing it would have gone over better?